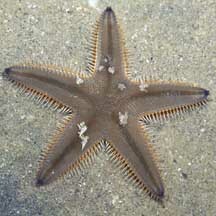 Eating and being eaten is not the only way living things interact on our shores. Many live in close association with one another to increase the chances of survival of one or both of them. This includes animals which are quite different and even plants living inside animals. Such a relationship is called symbiosis. Mutualism: In mutualism, both partners benefit. Reef-building hard corals harbour in their tentacles, microscopic single-celled algae (called zooxanthellae). The algae undergo photosynthesis to produce food from sunlight. 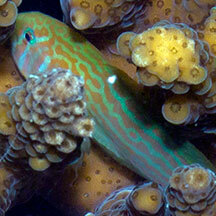 The food produced is shared with the coral polyps, which in return provides the algae with shelter and minerals. This arrangement allows hard corals to build reefs that in turn form the basis of shelter and food for the vast variety of reef life. 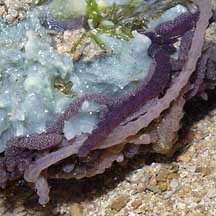 Many other animals have a similar arrangement with zooxanthallae, including giant clams, carpet anemones and some sponges. 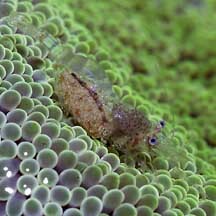 Tiny transparent shrimps (about 1cm) are sometimes seen among the Carpet anemone's tentacles. It is not certain how they avoid being stung by the tentacles. 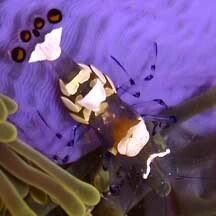 The shrimps find refuge and in turn, they may help keep the Carpet anemone clean. A similar arrangement is found between anemonefishes and sea anemones. Commensalism: In commensalism, one living thing benefits at no expense or gain to the other. 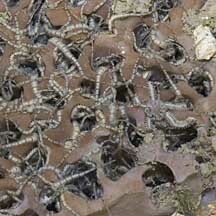 Tiny brittle stars may find shelter inside a sponge. While the brittle stars enjoy a continuous flow of food and oxygen, it probably makes no difference to the sponge. 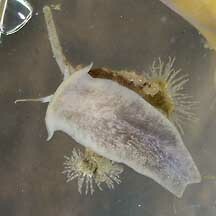 The Slipper snail (Crepidula sp.) is white and looks like a clam. It often settles on the inside of a shell occupied by a hermit crab. 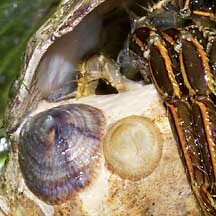 The snail enjoys the food and oxygen brought in with the flow of water generated by the hermit crab. The snail's presence, however, probably makes no difference to the hermit crab. 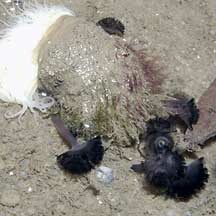 Small sea anemones may also settle on a shell occupied by a hermit crab. Parasitism: In parasitism, one living thing gains considerably at the expense of the other. 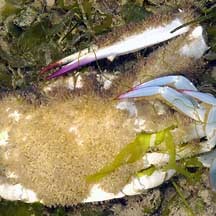 For example, the parasitic barnacle Thompsonia littoralis grows through the host crab like a root system, eventually breaking through the joints to produce egg sacs as shown in the photo at right. 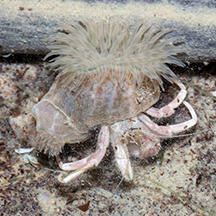 The parasite does not kill the crab but affects its reproductive system so it becomes infertile. Tiny shrimps live on carpet anemones. 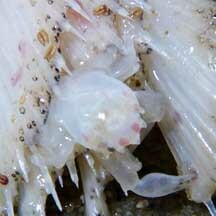 Tiny porcelain crabs live on sea pens. Tiny snails live on sand stars. Symbiosis Tan, Leo W. H. & Ng, Peter K. L., 1988. A Guide to Seashore Life. The Singapore Science Centre, Singapore. 160 pp. FREE photos of examples of symbiosis. Make your own badge here.